I mentioned the “Fetch PokerStars Tournament Results from Email…” item previously. 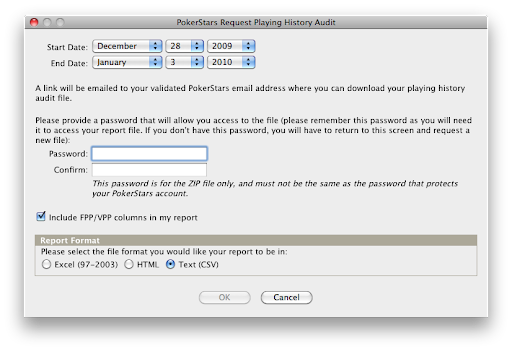 If you request this from PokerStars in CSV format, Poker Copilot can read it to augment the Tournament Summary e-mails. Augment? Yep. The tournament summary e-mails contain where you placed, but not info about addons and rebuys. The audit contains addons and rebuys but not info on your where placed. The two together give complete info.